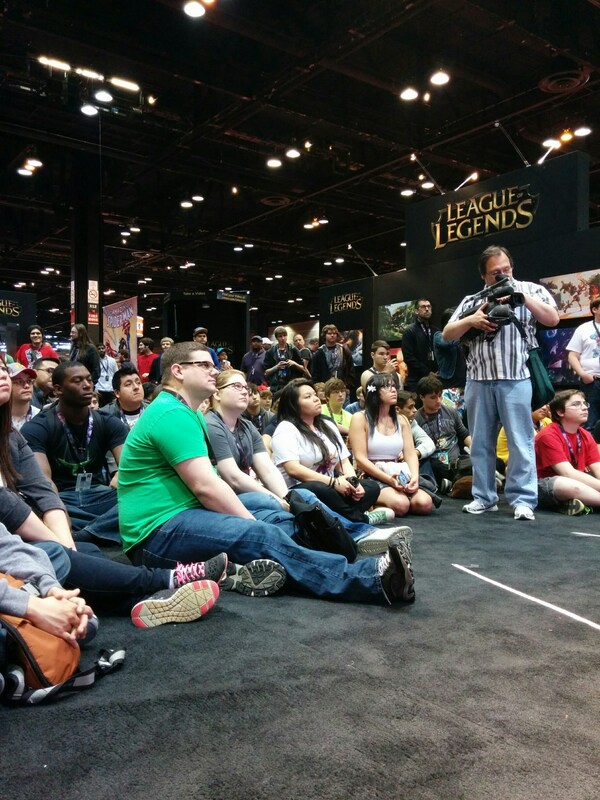 Surrender at 20: Red Post Collection: What Does Ghostcrawler do, WizardCrab grab bag, Live from C2E2, and more! 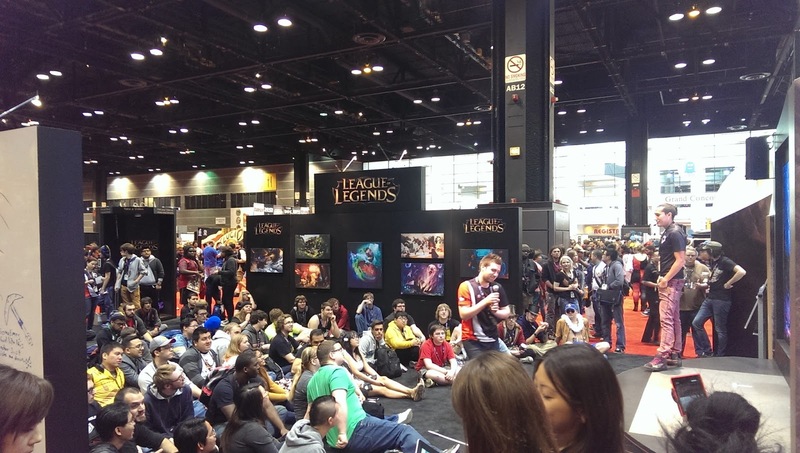 Red Post Collection: What Does Ghostcrawler do, WizardCrab grab bag, Live from C2E2, and more! This morning's red post collection features a ton of odds and ends discussion, including Triggs commenting on the Loss Prevention, Ghostcrawler clearing up what he's been working on during his time at Riot, WizardCrab chatting about several eCommerce topics such as Legendary skins being price protected and the recent limited skins promotion, and an update on what Riot is up today at this weekends C2E2 in Chicago! Continuing reading for more information! It's not as easy as it sounds, we'd have to somehow find out every single game that was affected during the incident and then apply it. How do you do that when an incident only affects 20% of games? We'd also have to go in and deduct half of winners LP gains, we'd have to demote people who got promoted. How would you determine what is worth doing that for? What threshold should have that big of an impact on leagues? This is the problem with applying LP too liberally. It has a huge impact on the server and people whos games are not affected by this lag. It disables ranked queues for the entire time it's on, it halves LP gains and prevents losses for people who should have lost. I agree that LP could be better and we've been improving it over the last few months, so we'll continue to do so." I can see the issues, but I feel like catering to your upset player base is worth accidentally preventing losses for people who legitimately lost a game. I also don't think the winning team should be affected at all. They still stayed in the game and played it. Even if it was easy due to the lag. I disagree with this 100%, I'm of the opinion that one game over the course of the season has a very insignificant impact on your placement. Edit: Imagine you play a game and it happens to occur during an incident but you were unaffected and otherwise unaware. You then get a message that your LP was halved and you were demoted because of retroactive LP. How upset would you be? Greg "Ghostcrawler" Street's, formerly of Blizzard, job and influence on LoL are quite the hot topic on the forums. "I spend nearly all of my time on management, recruiting, mentoring, and high-level direction. If you have feedback or concerns on specific changes or content, you're better off directing that to the developers who worked on them. Those dudes are pretty much all available on the Riot forums. They will be able to provide more detailed context into the goals and tactics of those designs then I would be able to offer. In fact, one of the high-level goals we have identified is better communication with you guys so that you understand the context for why we make changes and aren't surprised by stuff landing in patch notes that seems to come out of nowhere. Some players seem to have this expectation that I have the desire or ability to "put my stamp" on LoL, whatever that means. We have a very large team that works very hard to be strategically aligned. In fact, I've never seen a company that spends so much energy on alignment. Anything that goes into the game is very much the result of this team effort. If you're able to point at something and say "that was GC's doing," then I'm doing it wrong. That goes for any Rioter." As a follow up, he replied to the question "does Riot hire junior designers at all?" "All the time. Riot does a great job IMO of hiring for potential. Like most studios, you need to be a skilled designer, not just someone who really loves games, though being fluent in great games is also a requirement. Most importantly, you need to be able to solve difficult design problems and then evaluate your proposed solutions. We also have a great internship program"
With the arrival of Twitch's brand new visual update, he also received a massive expansion to his voice over - something like moving from 9 old lines to 80+ interactions. You're absolutely correct in noting that all of the earlier Champs have significantly fewer VO lines; I agree this is kind of a bummer. HOWEVER, with all of the reworked Champs we've seen since the inception of the Relaunch Team, there has been a pretty dramatic jump in line counts. All I can say is that whenever we do a proper relaunch, an expanded VO set will be part of the package; and the Relaunch Team is a train that ain't stopping any time soon!" "I can tell you that if we ever put legendary skins on sale again, we'll do the same thing and refund everyone." "I don't think so. I think I'm being rather upfront. Legendary skins are a price-protected tier. You can feel comfortable buying one knowing that there is never going to be a sale just around the corner on it, and anyone who has that skin paid the same price you did. If there ever is a sale on that skin, you will get a refund for the difference in price from the original to the sale, as if you too had purchased it at that discount. I only jumped in this thread because OP said that he or she missed the Riot that did this, and we're still here. This policy hasn't changed. But the Riot back then never planned to put legendary skins on sale, and neither does the one today." My bad; that's always been the policy and I didn't realize it wasn't very well known. Even before we put those 4 ones on sale. We never planned to do that either, but from what I understand it had to do with their retirement (I wasn't at Riot at the time). I apologize for accidentally misleading you then. "Well I'm sorry you feel that way. I know we decided to move away from the limited skins thing contrary to what we had previously said, but I think there's a worthwhile distinction between intentionally misleading you (otherwise known as lying) and determining that our old philosophy was a fundamentally flawed one and that it hurt so many more players than it protected. We didn't make the decision lightly. It took over a year of discussions, research, and general back-and-forth. I think you might feel a little differently if you saw some of the thousands of passionate emails begging for a favorite limited skin. In the end I know the decision hurt some players like yourself, and I'm sorry for that, but I do hope you take a second to appreciate the position we were in and the droves of fans who are now able to show up on the Rift with the Kitty Cat Katarina or Definitely Not Blitzcrank skins that they have been dreaming about these last few years." "As for Championship Riven, we never actually intended for her to be limited. It was a mistake due to poor communication that she ended up being limited. :("
WizardCrab continued on in the thread, fielding all sorts of eCommerce questions! "1) We're not going to sell Medieval Twitch. And we didn't end up selling Goth Annie in the end. The only way to get her is through the bundle. 2) We don't have any plans right now to change the sales structure up." "I responded about the forum exploit. I know nothing about it. I can't respond to "Riot not being Riot." What could I possibly say? I can't give out release dates or even hint at them so I can't say when SKT T1 skins will come out. It's a lot more difficult to find two people to mystery gift each other than it is to just buy mystery skins yourself when it was active. The first one wasn't an issue. The second one might be. There really isn't much else to discuss here I don't think." "It was about picking champions that represented their entire season and rise to the world champions. Not just what was used in the final match. You'll find each of the players from SKT T1 of last year using each of those champions to their fullest potential throughout the season." "This is actively being worked upon. I would like to tell you it will be sometime this year but there's always a chance for things slipping so I can't officially say that." WizardCrab also answered a question about the return of the elusive Rusty Blitzcrank skin, noting there is no current plan to bring him back. "We reserve the right to, and would refund anyone who had every purchased him just like we've done with the other LE skins, but we have no plans to bring him back currently." 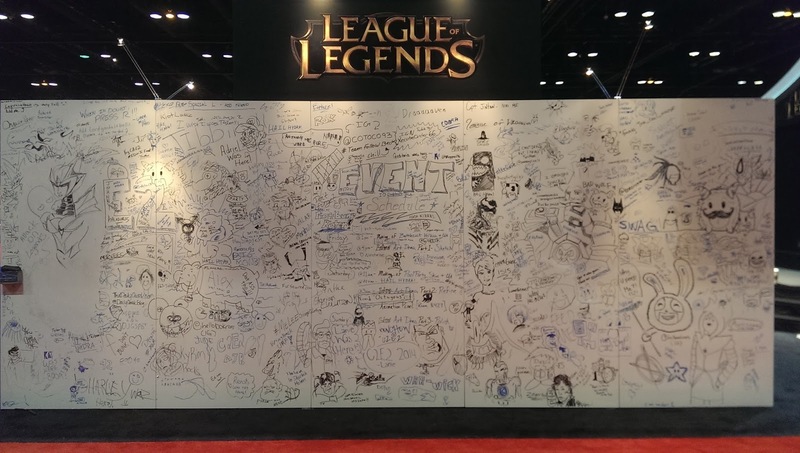 RiotExLibris has whipped up two posts showing off what Riot's up in Chicago for C2E2 - one on the community white board on day one and one discussing the "Pool Party Animation Demo!" from day two! "After a successful debut at PAX, we've brought our whiteboard walls to C2E2, ready for scribbling, scribing and sketching from anyone walking by. With a wide open field, from the youngest fans to established comic book artists and every style, age and skill range in between, the blank space filled up quickly. 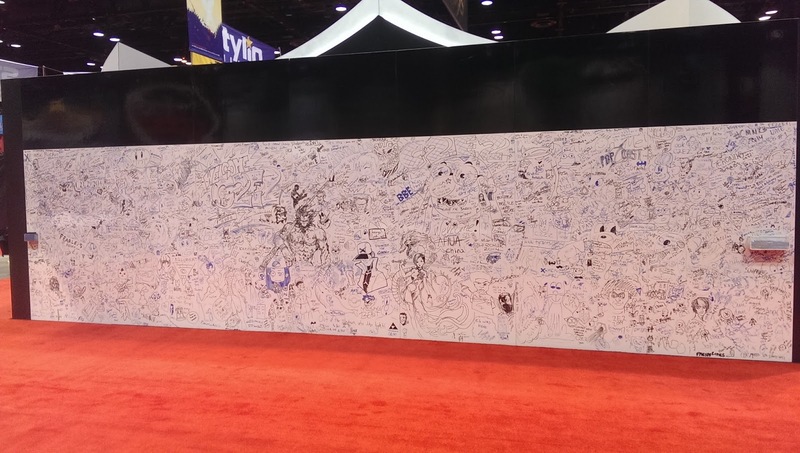 Check out the full walls from day one at C2E2, and let us know below if you spotted your addition to the community creations!" 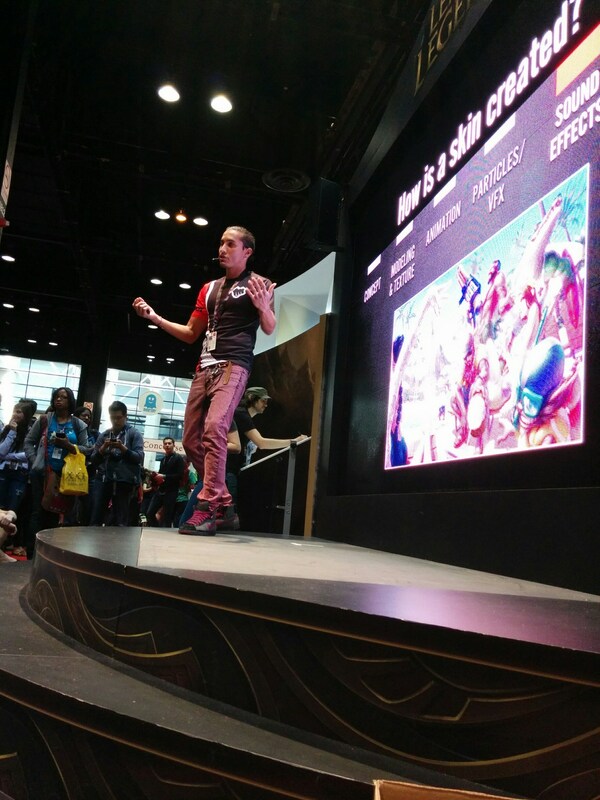 "Shoquistador took to the stage on day two of C2E2 to lead players through how Pool Party Graves learned his moves. Animating a skin starts with understanding the base model and the shape language that makes each champion instantly recognizable, he explained. Showing Graves in his traditional outlaw garb, Sho shared that Pool Party Graves originally had dreadlocks. When the model was silhouetted, the team realized that he wasn't nearly as recognizable as he needed to be. With Graves' inconsistent hairstyle explained, the audience followed along as recall animations, reloading clips, dashes and particles were added to the skin. Showcasing four of Graves' diving board animations, the animator went behind the scenes to illustrate the inspiration behind the character model's movement. Rigging, modeling, rendering and several more stages breathe life into the static sprites, transforming the motionless husk into a swaggering hunk. Rapid-fire Q&A followed the demonstration, as players delved for details surrounding the next possible skin releases. Will Pizza Delivery Sivir arrive in 30 minutes or less? How outrageous would Armor of the Fifth Age Braum be? Sho emphasized how much he loves the silly, troll-ish, occasionally nonsensical skins. Turning a serious champion into a playful trickster doesn't always work, but he highlighted Weather Lady Janna or Pool Party Ziggs as particularly successful examples of the archetype he's always looking forward to vivifying next." 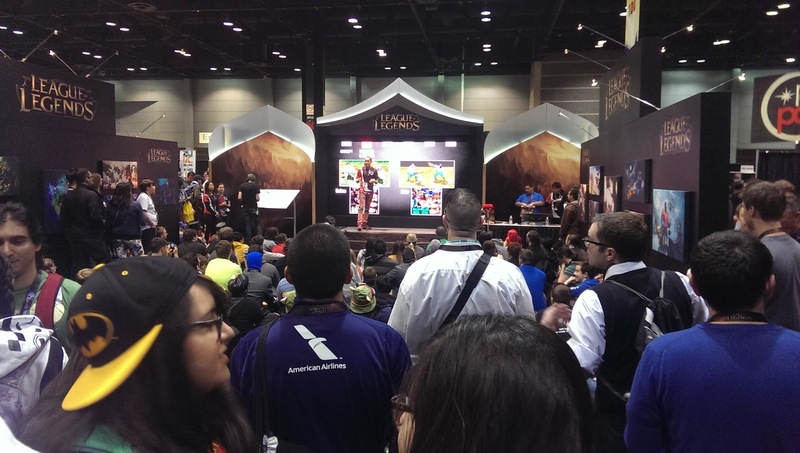 Looking for more coverage of C2E2? Don't forget to check out the Summoner Showcase tumblr!